Independence Day is one of the most important public holidays in Lebanon. This holiday celebrates the anniversary of the declaration of independence of Lebanon from France in 1943. During World War I people of Lebanon suffered great losses and starvation, their land was devastated. Lebanon became a part of the state of Greater Lebanon under the French mandate of Lebanon and Syria in 1920. In 1926 France formed the Lebanese Republic. After the beginning of World War II, German occupation and installation of the Vichy government in 1940, the Lebanese tension towards independence started growing. It was supported by the fact that the Vichy government allowed to move the German aircraft supplies through Syria to Iraq, where they were used against British forces. The United Kingdom was afraid that Germany would eventually gain full control over Lebanon and Syria and sent its army there. The French General Charles de Gaulle visited Lebanon after the end of the fight and promised its government recognition of independence under the authority of the Free French government. In 1943 elections to the new Lebanese government were held and it finally canceled the French mandate on November 8, 1943. 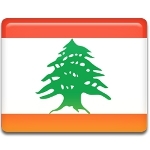 France recognized independence of Lebanon on November 22, 1943.